Take A Chance was originally released in 1980 when Singer/songwriter, Mike Hanrahan, replaced Tony Callinan. This their second album on Tara featured for the first time, from Stockton's Wing some original music and marked the arrival of a progressive force into the world of Irish music.The album also features the voice of Maura O'Connell who later went on to gain international recognition with De Dannan and in her own right. Prior to this Maura and Mike Hanrahan had been performing together as a duo called Tumbelweed. In addition to a fine selection of Reels & Jigs including, 'Boys Of The Lough & The Star of Munster', 'The Frost Is All Over & The Queen Of The Rushes' and 'Austin Tierneys, Hughie Travers, Jenny's Chickens' the album also contains three songs from Mike Hanrahan 'Ten Thousand Miles', 'Fiddler John' and his own composition 'Take A Chance' which was to pave the way for the group's later success with his compositions 'Beautiful Affair' and 'Walk Away'. Another track on the album 'The Postman' must surely have been the first bodhran solo to feature on an Irish traditional album. Master bodhran player and percussionist Tommy (Spoons) Hayes at his flying best. 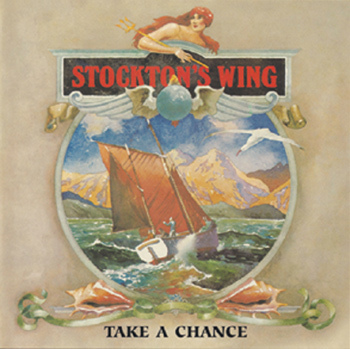 The success of Take A Chance launched Stockton's Wing on the European market and in the years that followed, they toured extensively, creating a storm of enthusiasm at major Folk Festivals across Europe.